On the 27th of February, 2019, a well-known Lithuanian politician, deputy of the Sejm, Chairman of the Parliamentary Committee of the Lithuanian Sejm in foreign affairs, and head of inter-parliamentary group of the Sejm and Knesset Mr. Emanuelis Zingeris was in Kiev with a short visit. 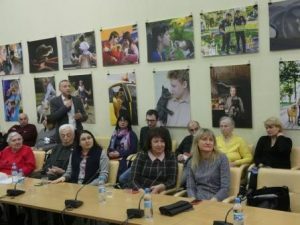 Taking this opportunity, the All-Ukrainian Charitable Fund “2U”, together with the Embassy of the Republic of Lithuania in Ukraine, decided to invite Mr. Zingeris and organize a meeting and discussion dedicated to Lithuanian experience in preserving the Jewish heritage and memory of the Holocaust. 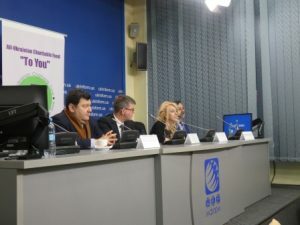 Julia Goldenberg, the head and founder of the ACF “2U” mentioned in her opening speech that the long-term and invaluable experience of one of the EU countries can become a vivid example for Ukraine. 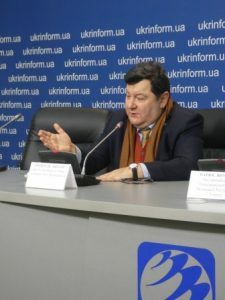 Everyone who was present at the Ukrinform conference-hall shared her opinion: not only the heads of Jewish organizations of Ukraine came to the event but the people’s deputies who are not indifferent to the preservation of historical memory, the researchers of the history of the WWII, well-known human rights activists as well… Ambassador Extraordinary and Plenipotentiary of Lithuania to Ukraine Marius Janukonis, presenting the guest, mentioned that “today we have a unique opportunity to communicate with one of the most well-known European politicians and a great friend of Ukraine.” This fact was confirmed by one of the meeting moderators Georgiy Logvinsky, People’s Deputy of Ukraine, Vice-President of the European People’s Party at the Council of Europe (the most numerous political group in the PACE), which member Mr. Zingeris is as well. A special place at the hall was reserved for the Righteous Among the Nations, due to them many Jewish families could survived, and together with them Jewish identity, the Jewish language “Yiddish”, Jewish culture were preserved. All the participants applauded standing to these people. 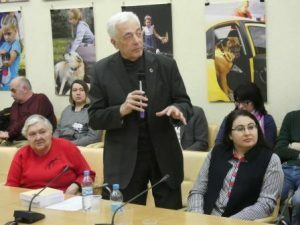 Reminding the events in Lithuania, where about 95 percent of the Jewish population was murdered during the WWII, Mr. Zingeris emphasized the importance of remembering the feat and heroism of the Righteous Gentiles and encouraged the Ukrainian community to adopt Lithuanian experience. “We struggle that with the names of the Righteous, which are a vivid example of the antifascists, the streets of the places where they were from would be named. It will save the memory of them for ages,” said the honored guest. 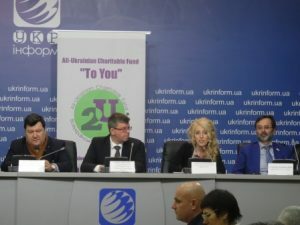 Mrs. Goldberg informed him that the ACF “2U” had already sent to Kiev authorities a request to rename one of the streets in Kiev in honor of the Righteous. After Mr. Zingeris’s speech, many questions were heard from the audience. Guests were interested in his opinion on the modern life in Ukraine, today’s life of Lithuanian Jewish Community, problems with preservation of historic heritage. It seemed the meeting could continue for some more hours, but the guest was hurrying to his flight, however he promised to visit Kiev soon and meet the Community again.